I’d been playing around with sub-ohm vaping for a while, starting with the Vapouriz Sub Tank, and then moving onto the Vapouriz VBox 40W, and also the Vape Direct Voyage Sub Ohm Mini Kit, but I felt it was time for a little something different. Something bigger, a bit more complicated, with more options, perhaps? It was after Dan bought himself the Kanger KBox 70 Box Mod that I started to look closely into the Kangertech range, and after trying a few tanks, and more than a few coils, I finally decided upon the Kangertech Topbox Nano, an updated version of the Kanger Subox Nano starter kit. I bought mine from the UK ECIG STORE, and it was described as “the perfect kit to aid anyone in their introduction into the world of e cigarettes”. A beginner to the world of vaping and e-cigarettes I’m not, but I am a relative newbie when it comes to these bigger ‘box mods’. I decided to take a closer look and investigate for myself. For under £70, that’s actually not a bad deal. I actually forgot I ordered the extra 5x coils until about three or four months after I bought the lot … Silly me. I put them somewhere safe … and then forgot where that somewhere safe was. And that I’d bought them in the first place. 2 – It’s worth adding on those extras – the battery and coils, etc. Like I said, you get them cheaper, and you DO need the battery / batteries if you don’t have them at home. I didn’t, so if I hadn’t ordered them at the time, I would have needed to order or buy them from somewhere else. 3 – Don’t forget your e-liquid. If these are your first steps into the world of sub-ohm vaping, you’ll soon realise your regular e-liquid that you were using in the likes of a Vapouriz Fuse (for example) or the V2 Cigs Ex Series now won’t work. You get a bottle included with your order from UK ECIG STORE, but if you plan on using the 1.5ohm coil that comes with the starter kit, you’ll also need regular non sub-ohm e-liquid too. Firstly, what does SSOCC mean? I investigated because I didn’t have a clue. SSOCC – Stainless Steel Organic Cotton Coils. Secondly, what is a Clapton coil? I investigated again because I didn’t have a clue. 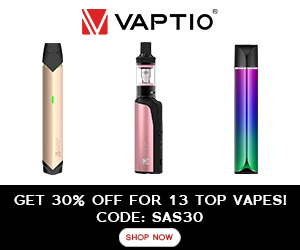 Clapton coil – “A Clapton coil is a vape wire consisting of a core of wire tightly wrapped by, usually, a thinner gauge wire.” I found this information on vaping360.com – thanks for that. You DO NOT get a battery with your starter kit. I added a Vaping Outlaws Vape Cell 18650 25A 2500mAh Battery to my order. You can buy these HERE for £7.99. Once again, I can’t tell you how much the lack of batteries in these box odd infuriates me. You could also use any of the batteries that you’ll find on this page. I was totally intimidated by this when it turned up, but read the rest of this Kangertech Topbox Nano review before you make your final decision. After waiting for Dan to get home and show me how to use it, I realised it wasn’t actually all that difficult to use. I didn’t need the temperature control, which somehow made me think that perhaps such a big and complicated box unit was too complex for my rather simple needs, but it’s a vaporiser that even beginners will be able to get their head around with a little bit of practice. I got the pink one, but there are other colours available – black and lilac. It looks nice, and it’s made from serious materials too. It’s not cheap or plastic-feeling or looking. In fact, it’s really very nice. It’s heavy enough to make you think that you’re holding something worth holding, but at the same time, it’s not too heavy that you can’t bear the thought of carrying it around in your pocket. Does that make sense? It’s nice – a nice weight. Right, the first thing that you should be aware of is that the batteries on these bigger, sub-ohm and box mod units are not the same as the ones that you’d get in a smaller, more compact vaporiser. For example, if you were using something like that Vapouriz Fuse, a 650mAh battery would give you about five to seven hours use. I would hazard a guess at about 6.5 hours of ‘regular’ vaping. If you have a regular 9-5 job, the Fuse battery would last you the day if you were vaping for an hour in the morning, scattered and stolen puffs throughout the day, an hour at lunchtime, an hour on the journey home, and then some in the evening. Sub-ohm units use more power from the battery, so the 2500mAh wouldn’t last for 25 hours like I would estimate it would last from the smaller models. It depends on the tank you’re using – the kind of vaping you like. However, when I took the 0.5 ohm coil out (for sub-ohm liquid) and replaced it with the 1.5 ohm coil (for ‘regular’ vaping), I found that a fully charged battery was lasting me for well over a day. In short – regular vaping (mouth-to-lung), you’ll get about 23-25 hours worth of vape hours, as long as you’re not chain-puffing. If your’e sub-ohming, you’ll get a fraction of that – I’d say about 4-8 hours. It all depends on how much you’re using it, and I tend to find that I use my vaporiser a lot less when I’m sub-ohming. Although I don’t have anything to really reference it to, the Vaping Outlaws Vape Cell 18650 25A 2500mAh battery was just fine. It worked, it’s still working, it seems to hold it’s charge really well, and I’m still getting more than a day’s worth of use out of a regular / mouth-to-lung tank. That’s good enough for me … Until I learn how to use it better / to the best of its ability obviously. So, the Kangertech Topbox Nano 3.2ml capacity tank can be used for both regular and sub-ohm vaping (as we’ve established) which is great because with the quick change of a coil, you can change your style of vaping. The only thing I don’t think that Kangertech has taken into account is the mouthpiece. The larger round mouthpiece is fine all the time you’re sub-ohming because most sub-ohm tanks have that wider-opening. With regular / mouth-to-lung vaping however, the larger, wider, more-open mouthpiece just didn’t feel right. It was too much to take in, made me cough, and I kept finding myself turning the wattage down to compensate. In the end, I almost resorted to changing the coil and only using it as a sub-ohm device. I decided to give it another shot, but this time I took the removable mouthpiece from my old JacVapour 510 Twist, and replaced the pink wider one from the Kangertech Nano Topbox with it. I turned the power back up to 14.0 – 15.0 watts, and I LOVED it. I’m really glad I thought about trying that different mouthpiece. Apart from that minor detail, I’ve had no problems using this tank with either mouth-to-lung or sub-ohm vaping. I’ve never had a leak, it’s never broken, it doesn’t gurgle (apart from when the liquid in the tank gets too low), and it doesn’t get really hot either. So far, so good. I am suitably impressed. Obviously the throat hit and vapour you’ll get from an electronic cigarette or vaporiser will depend on a number of things, the liquid and battery you’re using the tank on being very important, as well as the coil, and the power you’re on. I LOVE the fact that with the click of a button, you can easily turn up or down the watts on your vaporiser. I’ve had a few variable voltage / changeable wattage vaporisers over the years, and I’m learning that it’s something I now can’t live without. As much as I love other models, such as the Vape Direct Voyage Sub Ohm Mini Kit, for example, I miss those + and – minus buttons so much when they’re not there. I really like to have options. I’ve used a number of different liquids in my Kangertech Nano Topbox – Nicogreen and VIP regular liquid, and Morning Glory, Riot Squad, Cheap Thrills, and Pure Evil for sub-ohm. I’ve never had a problem. I found Cheap Thrills e-liquid went through the coils quite quickly, but I’ve found that’s just the case with that liquid – it goes through all coils across all vaporisers really quickly. It’s such a shame as I love the flavour so much. You can read all about it in the review HERE. I really, really loved this vaporiser. It looks good, it feels good in the hand, and it’s super durable too. I’ve thrown this thing around so many times, and it’s never once broken. The only thing that happens is the magnetic battery cover falls off from time to time. The tank has never broken (unlike my recent Vape Direct Trek which smashed with a fall of just two feet), and it works exactly as it should do every time. Who would I recommend this vaporiser too? Well … it may seem a little daunting for a beginner, but it’s really not. There are a lot of functions on offer here, but you don’t need to use them all, and I don’t really feel like I’ve wasted money buying something that’s too advanced for my needs. £70 for the entire package is worth it for a regular / mouth-to-lung vaporiser that lasts the day alone! Imagine never needing to worry about a spare battery, or whether or not you’ve got your charger in your bag. You can even turn the power down when you’re getting to the end, scraping the last final puffs out of that dying battery. I think that Kangertech should include a secondary thinner mouthpiece in this starter kit, and perhaps throw in a damn battery too, but aside from that, I genuinely have no complaints about this vaporiser. It does everything it says on the tin, and then some too! More power when you want it, less power when you don’t, a range of options to suit basically everything you could want from it, and all in a really tidy looking device that everyone who’s seen it has loved. I’d say that was well worth the 5/5 stars I’m about to give it, and the £70 I paid for the full package too. Have you ever used this model? I’d love to know your Kangertech Topbox Nano review. Leave your comments below, or get in touch via the powers of social media. Let’s get interactive! I purchased my Kangertech Nano Topbox from UK ECIG STORE, and the website’s users have rated it 4.65 out of 5 in 3 reviews. If you click on the red link, you’ll be taken to the deal. Final note: Be wary when purchasing brand-named / big-named vaping products from Amazon. I have noticed in some of the reviews (for this product particularly) that people believe them to be fake. I received a certificate of authenticity in my box, and you should look for one in yours too. *All prices and details correct at time of writing. Next: Have You Seen the Vype Pebble? I really like this vape top box. I got the black one, and its Vape eliquids are awesome and affordable. but there are other colours available – pink and lilac. It looks nice, and it’s made from serious materials too. It’s not cheap or plastic-feeling or looking. In fact, it’s really very nice. It’s heavy enough to make you think that you’re holding something worth holding, but at the same time, it’s not too heavy that you can’t bear the thought of carrying it around in your pocket.